My son recently turned 17 and I decided to buy him a used car that needed some minor repairs, so I thought. It was a Toyota Camry 2006 and the interior and body looked well cared for. I bought a package of Zwipes Microfiber cleaning cloths 36-pack to help with the full tune up that the car needs. The Tune-up went well but during the oil change, I opened the wrong valve and my garage is now full of oil. This brand of Microfiber cloths saved the day and I think everyone should own them for cleaning duties. If you own a car or truck one of the issues you might face is what type of washing cloth to use when you decide to clean your automobile by yourself. Microfiber cloths are now hugely popular all around the world, and I will bring you the review of one of the best ones you can buy for less. Zwipes Microfiber cloths is super soft and plush! This cloth is ideal for cleaning tasks needed in your office, home, garage, car and more. Each square inch of the cloth is constructed with at least 110,000 fibers, which enables cleaning without or with detergents or chemicals. This product allows for streak-free, lint-free cleaning. The non-abrasive nature of the Zwipes Microfiber cloths won’t scratch paints, surfaces, or clear coats. It has the ability to absorb at least more than eight times its weight in water and has the potential to dry in 50% less time than standard towels. This particular feature allows you to reuse the cloth hundreds of times, thus saving you money on costly cleaners and paper towels. Each of the Zwipes Microfiber cleaning cloths has an exact measurement of 12″ x 16″, and can be bought in different packages. 1 – Zwipes clothes are so plush that you can use them to clean your car or any surface, either with or without chemicals. 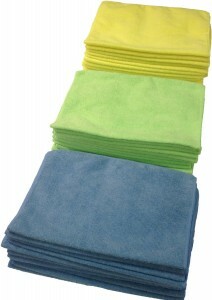 2 – This Microfiber cloth can be machine washed and reused multiple times. Most reviewers online confirm they used it over hundred times. 3 – Zwipes are made with special materials which enables streak free cleaning. Not only can you use it to clean your car, the clothes can also be used to clean up any mess in your office or garage. You can machine or hand wash the clothes. Better to tumble dry on low settings. Please do not use any type of fabric softener as it will clog the Microfibers which reduces performance level. Next post: Should You Get an Extended Warranty on a New Car?